From a high-design show-room in London's city centre. (actual photo, of when it was on display earlier this year). Items are stored in a facility in Kent. No VAT invoice will be provided. Also available under the same condition of sale (5% discount for multiple-item sale). BM484110 Combi-microwave oven 400 series. RB492304 Vario fridge-freezer combination 400 series. 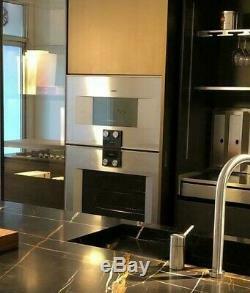 The item "SALE Gaggenau BM484110 Combi-microwave oven 400 series (Ex-Display) RRP £5,850" is in sale since Monday, February 11, 2019.